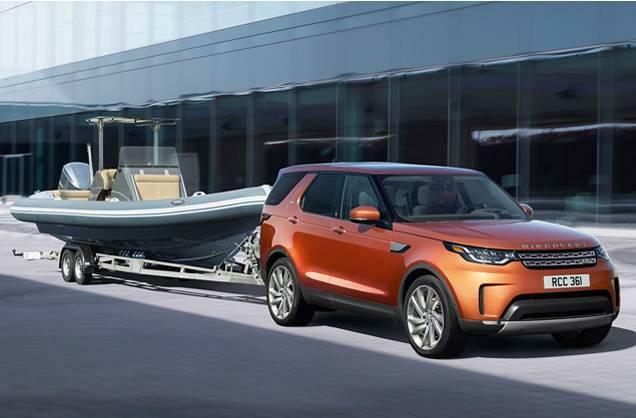 The wait is almost over for the exciting new 2017 Land Rover Discovery! This luxury SUV should be available in a couple of months and it will be worth the wait! The 2017 Land Rover Discovery features an assertive, recognizable exterior design with a modern and sophisticated edge. That is paired with a versatile interior design aimed at comfort and convenience. The available seven-seat configuration offers comfortable seating for seven adults and offers optional Intelligent Seat Fold technology. Therefore, you can easily configure the second and third row seating with a touch of a button, even on your cell phone. If capability is on your mind, the Land Rover Discovery has you covered. Choose from a 3.0L Turbocharged diesel engine or a 340-hp Supercharged VW engine. Either way you are going to be thrilled with the power, performance, and efficiency of your engine choice. Your Land Rover Discovery will be just as comfortable off-road as on the city streets thanks to several features aimed at this capability. Electronic Air Suspension adjusts height as necessary to provide impressive ride quality. Also, Corner Brake Control is a feature that helps create a stable braking situation in corners. In addition, our optional Terrain Response® 2 System monitors driving conditions and can automatically select the appropriate drive mode. Comfort and refinement are hallmarks of the interior on the 2017 Land Rover Discovery. You are sure to appreciate the expert craftsmanship and quality materials, such as premium leather and wood and metal finishes. These make the Land Rover Discovery interior something truly special. From the panoramic roof that give plenty of natural light to the power interior blinds that allow privacy and shade as needed, we though through all of the details. Entertainment and connectivity are also effectively addressed with our Land Rover InControl® Touch and available (depending upon trim level) Land Rover InControl® Touch Pro™ systems. The Pro system available on the Discovery HSE and HSE Luxury models includes a 10” HD touchscreen, plug and play USB ports, and connected navigation with WiFi hotspot. Also, choose from an impressive selection of Meridian audio systems. Thirteen-speaker and 19-speaker systems with Dynamic Volume Control to reduce bothersome unwanted noise are available. The 2017 Land Rover Discovery offers you capability, connectivity, and information at your fingertips! Powerful performance, luxurious and refined design, and a variety of advanced technologies are what you can expect when you buy your 2017 Land Rover Discovery. Wouldn’t you like to be one of the first in Colorado to own this luxury SUV? Let Land Rover Colorado Springs help you place your order today!